by Chris Woodford. Last updated: December 21, 2018. Reach out and touch the tip of your finger to the tip of your nose. No problem! Try it again with your eyes closed and it's still simple: you never miss. Even in clumsy people like me, the brain mostly has control of the body. In athletes, artists, ballet dancers, and surgeons, "control" means absolute precision. Now imagine trying to build a robot with the same degree of mechanical excellence, using gears, wheels, and levers to accomplish what the body does with muscle and bone. It's a much taller order, which makes the human body seem even more impressive. One of the big difficulties of making well-behaved robots is that simple electric motors are impossible to move precisely. That's why a lot of robots swap ordinary motors for what are called stepper motors (or, sometimes, stepping motors), which can turn through "steps"—well-defined angles—under precise electronic control. What are they are how do they work? Let's take a closer look! Photo: A couple of typical DC stepper motors from an old inkjet printer. How do we know? There are multiple leads coming out of them (unlike with a simple DC motor, which has only two leads). 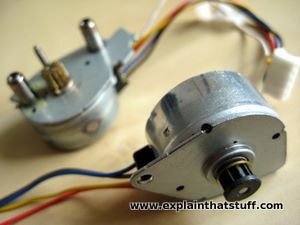 Another way of telling a stepper motor is to hold it near your ear and slowly rotate the axle with your fingers. You should hear and feel the individual steps, a bit like winding a wristwatch. What's wrong with ordinary electric motors? An ordinary electric motor is based on a simple bit of magnet science we all learn at school: unlike poles attract, like poles repel. Here's how a basic motor works. You take a ring-shaped magnet, put a coil of wire inside it, and feed electricity through the wire. The wire becomes a temporary magnet powered by electricity—an electromagnet, in other words—and the magnetic field it creates repels the field from the permanent magnet that surrounds it. By switching the current on and off with a clever little device called a commutator, and some electrical contacts called brushes, you can make the wire rotate in the same direction indefinitely. Feed electricity (electrical energy) into it and you get motion (mechanical energy) back out. That's the essence of an ordinary motor that uses DC (direct current) electricity. If you're less than sure how a motor like this works, you might want to check out our introductory article about electric motors. Photo: The powerful electric motor from an old lawn mower. The slots at the front are part of the commutator, which is an ingenious device that reverses the electric current and keeps the rotor (the rotating, central part of the motor) spinning in the same direction. We can also make motors that work using AC (alternating current) instead of DC. Although they're engineered in a radically different way, they're still based on "like poles repel, unlike poles attract": the electricity that powers the motor creates magnetic attraction and repulsion, and a force that makes the motor spin. You'll find more about AC motors—which are also called induction motors—in our article on AC induction motors. Whether they're powered by DC or AC, ordinary motors are the hidden electric muscles that power modern life: you'll find them in all kinds of gadgets and gizmos in the world around you, from food blenders and refrigerators to vacuum cleaners and electric trains. But in all these machines, the rotors of their motors spin continuously. When you vacuum a carpet or commute to work by subway, the motors that are working for you turn around an arbitrary number of times: there's no precise control over how many times they rotate and what angle they spin through—and it really doesn't matter. 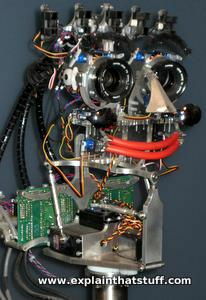 Photo: Motor mouth: This "emotional" robot has a face that can show different expressions. The various parts are operated by stepper motors, precisely controlled by electronic circuits. Now suppose you want to make an electric-powered robot arm that turns through an exact angle (an exact number of degrees) so it can successfully grab a cup of coffee off your desk. You could fit an electric motor onto a wooden or plastic lever to make it turn when you switch on the power, and you could flick the power on very briefly so the arm sweeps through a certain angle and then stops. The trouble is, there's no way of knowing how much of an angle the motor (or the arm) will move: it depends on everything from the power of the motor and the electric current driving it to the weight of the arm and even which way the wind is blowing. A motor that moves in such an arbitrary way is no use whatever in robotics: your coffee will surely end up on the floor! That's where a stepper motor comes in: it's a special kind of DC motor designed so you can make it rotate through a precise angle, instead of spinning round by a random amount. What exactly is a stepper motor? Photo: The philosophy of steps: we think of steps as a way to climb up, but they're also a way to break a fixed distance into equal-sized pieces so we get more control over our movements. We can think of them as turning vague, variable, analog amounts of distance into specific, discrete, digital chunks. 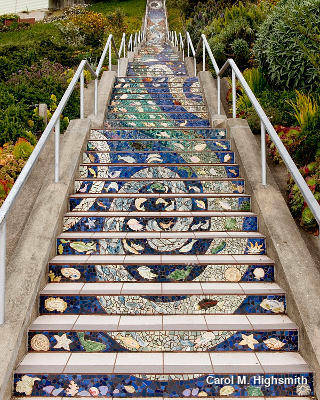 Photo of The 16th Avenue Tiled Steps Project, San Francisco, courtesy of the Jon B. Lovelace Collection of California Photographs in Carol M. Highsmith's America Project, Library of Congress, Prints and Photographs Division. Stepper motors are different from ordinary DC motors in at least four important ways. The second major difference is in what rotates. Remember that in a basic DC motor, there is an outer permanent magnet or magnets that stays static, known as the stator, and an inner coil or coils of wire that rotates inside it, which is the rotor. In a brushless hub-motor, the coils of wire are static in the center and the permanent magnets spin around them on the outside. A stepper motor is different again. This time, the permanent magnets are on the inside and rotate (making up the rotor), while the coils are on the outside and stay static (making up the stator). 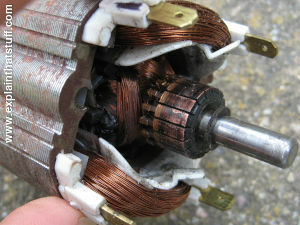 The third big difference between an ordinary DC motor and a stepper motor is in the design of the stator and the rotor. Instead of one large magnet on the outside (the stator) and one large coil rotating inside it (the rotor), a stepper motor has an inner magnet effectively divided up into many separate sections, which look like teeth on a gear wheel. The outer coils have corresponding teeth that provide magnetic impulses, attracting, repelling, and making the teeth of the inner wheel rotate by small steps. This will become clear in a moment when we look at some pictures. The final difference is that a stepper motor can stay still, in a certain position, once it's rotated through a particular angle. That's obviously crucially important if you want a motor to power something like a robot arm, which might have to rotate a certain amount and then remain in precisely that spot while another part of the robot does something else. This feature is sometimes called holding torque (torque is the rotary force something has, so "holding torque" simply means a stepping motor's ability to stay still). I'm going to simplify stepper motors here to illustrate the simple, central idea: the (inside) rotor of a stepper motor turns by small, discrete amounts (steps) because the (outside) stator applies magnetic impulses that pull and push it around. Photo: A stepper motor's rotor is made from two discs placed together so we get a series of alternating north and south poles. 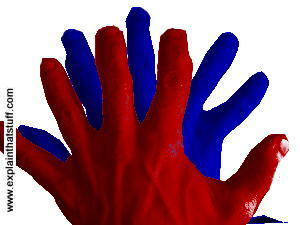 I've simulated the idea by coloring my hands and putting them on top of one another so the fingers alternate when viewed from above. The rotor itself is made from two discs, a little like gears, one of which is a magnetic north pole (red) and the other is a south pole (blue). When we put the two discs back to back, we get north and south pole teeth alternating around the edge. If you find that hard to picture, imagine your left hand is a magnetic north pole and is colored red, while your right hand is a magnetic south pole and colored blue. If you put one hand on top of the other so the fingers of one hand alternate with the fingers of the other, then look down, you'll see alternating north and south pole "teeth" (the fingers) around the edge. 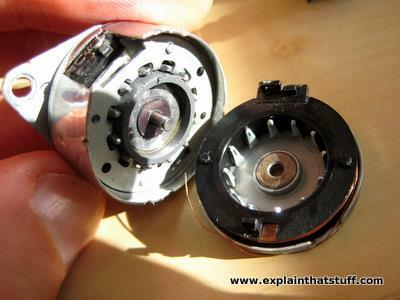 That's effectively what we have in the rotor of a stepper motor. Around the edge of the rotor, we have the stator: in this example, four electromagnets that can be switched on and off individually. Generally the electromagnets in a stepper motor work in pairs, with each opposing pair of magnets switching on together to make a north pole at the same time, followed by the magnets at right angles, which also work together. I prefer to draw it a slightly different way, which I think is simpler and easier to understand. Exactly what switches on when depends on how many rotor teeth (steps) there are and how many electromagnet coils surround them: the geometry and alignment of a stepper motor has to be just right to make the rotor turn. The right electromagnet is energized and becomes a north pole (red) and the left electromagnet becomes a south pole (blue). This pulls the rotor around by one step so a blue tooth on the rotor snaps toward the right electromagnet and a red tooth snaps toward the left electromagnet. Now the bottom electromagnet becomes a north pole, the top magnet becomes a south pole, and the two horizontal magnets are switched off. Again, the teeth of the rotor are pulled around by one step. The vertical magnets are now switched off and the horizontal magnets are switched on again, but with the opposite polarity (pattern of magnetism) that they had before. The teeth of the rotor advance by one more step. Finally, the vertical magnets are switched on again, in the opposite polarity to before, and the horizontal magnets are switched off. The rotor mores around one more step. The whole cycle then repeats. Remember that a stepper motor isn't really designed to keep spinning around and around: by sending as many or as few impulses to the outer electromagnets as necessary, we can make the rotor turn through a certain number of steps (and, therefore, by a precise angle). We can make it rotate the opposite way by reversing the electric current. This is just a simple overview of stepper motors and I won't go into details about all the numerous different varieties you'll find. A couple of technical terms that are worth knowing crop up often in the literature (and in web pages) about stepper motors, often without any explanation. The motor I've illustrated here has a rotor magnet divided into lots of alternating north and south poles, so this design is known as a multi-pole motor. The more poles, the shorter the distance the motor rotates on each step and the more precisely it can be controlled. In a motor, a "phase" usually means one or two opposing electromagnets that operate alternately (out of sync with one another or out of phase, if you prefer). The motor I've illustrated up above has two phases (two pairs of electromagnets, so four electromagnets in total, arranged at 90 degrees). In a three-phase stepper motor, you might have three electromagnets arranged at an angle of 120 degrees (so three individual electromagnets, although a three-phase motor could also have three pairs arranged 60 degrees apart). A four-phase motor has eight electromagnets arranged in four pairs, with each one separated from the next by 45 degrees. Photos: Inside a two-phase, can stack, stepper motor: Not all stepper motors look and work exactly like my artworks and animation up above. This is an example of a permanent magnet, can stack, stepper motor, in which the parts are arranged in layers. In the first photo, you can see what it looks like when you take the top off. In the second photo, I've taken all the bits out and arranged them in sequence. They are: 1) Upper stator cup and outer teeth. 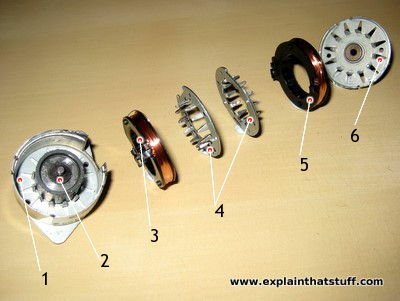 2) Rotor (a multi-pole permanent magnet fixed to a rotating shaft); 3) Upper coil; 4) Inner stator teeth; 5) Lower coil; 6) Lower stator cup and teeth. It works in a broadly similar way to the motor I've explained up above, except that the teeth are static (part of the stator), while a permanent magnet (made of multiple poles) rotates inside them and turns the motor shaft around as it does so. Photo: Inside an inkjet printer, a very common application of stepper motors. 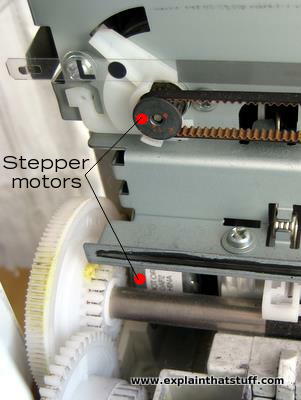 You can see two stepper motors here: the top one moves the ink cartridge and print head from left to right by turning the black and brown belt, while the bottom one spins the white gears, which turn the paper rollers and make the paper feed through. The reason for using a stepper motor is to achieve precise control: you can make it move through a defined angle. But there are drawbacks too. Stepper motors can sometimes be quite jerky, because they start and stop each step with a sudden impulse, which isn't always what you want if you're trying to build a precision machine. An alternative to using a stepper motor is to use a servo motor: a motor with a built-in feedback mechanism. Typically, a servo motor has what's called an optical encoder attached to its rotor. In plain English, that's a black-and-white patterned disc that moves in front of something like a photoelectric cell. As the disc turns, the cell detects the black and white pattern and an electronic circuit figures out from this exactly how much the disc has rotated. Using this feedback, the motor can be controlled more smoothly (and typically much more precisely) than a simple stepper motor. Servo motors are much more sophisticated in design than stepper motors and tend to be more expensive, which is why steppers are often used instead. Who invented the stepper motor? For my money, it was Frank W. Wood in a couple of patents filed between 1912 and 1918. Here's the 1918-filed design (officially patented on March 7, 1922), titled "Art of producing step-by-step movements," which uses an outer ring of five magnets (energized in various combinations) to make a pair of inner magnets and a shaft rotate. In Wood's own words, his gadget produces "step-by-step movements to a rotable element... provided by the resultant action of a plurality of magnetic circuits." 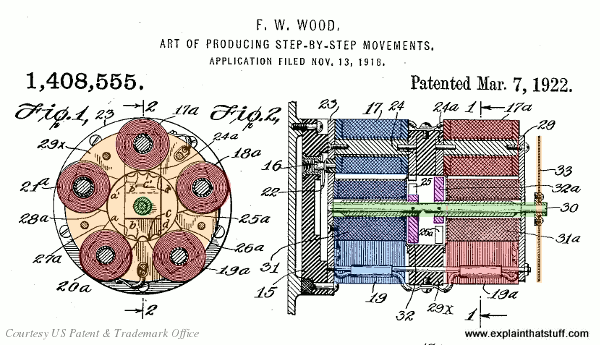 Artwork: Frank Wood's 1918 stepper motor design. Artwork from US Patent 1,408,555: Art of producing step-by-step movements, courtesy of US Patent and Trademark Office. Physclips: Electric motors and generators: This is a great introduction to AC and DC motors with lots of diagrams and animations. It includes a little bit of information about multi-pole motors and stepper motors. Motors for Makers: A Guide to Steppers, Servos, and Other Electrical Machines by Matthew Scarpino, Que Publishing, 2015. A refreshingly practical, hands-on guide for hobbyists. Stepping Motors: A Guide to Theory and Practice by Paul Acarnley, Institution of Engineering and Technology, 2002/2007. One of the most complete single-volume guides to stepper motors and the circuits needed to drive them. Electric Motors and Drives: Fundamentals, Types and Applications by Austin Hughes and Bill Drury, Newnes (Elsevier), 2013. A comprehensive guide to all kinds of motors. Chapter 10 ("Stepping and Switched-Reluctance Motors") covers stepper motors. How stepper motors are made and how they operate: This great animation, by Giorgos Lazaridis of the Pcbheaven website, takes a stepper motor apart completely, shows you exactly how it's made, and then shows how it works. A very good introduction that should (hopefully) fill in any gaps in your understanding from reading my own article. It shows the construction of the rotor very clearly. What is a stepper motor? : A more technical slideshow-type introduction from Microchip Technology, with more detail about how to choose a different motor for particular jobs. Also goes into the pros and cons of stepper motors and how to control them. US Patent 3,866,104: Five-phase stepping motor by Günter Heine, February 11, 1975. Most stepper motors use a simple, two-phase design; this one has five phases. US Patent 2,876,655: Stepper motor by Vernon Tauscher, Northrop Aircraft Inc., March 10, 1959. A simpler and earlier design. US Patent 1,408,555: Electrical indicator system by Frank Wood, Charles Cory & Son Inc., June 23, 1914. This is the earliest stepper motor I've found in the USPTO database. Some online sources hint that stepper motors were invented in 1920 by an Englishman named Walker, but I've been unable to track him down. Wood's later invention US Patent 1,408,555: Art of producing step-by-step movements (granted March 7, 1922) refers back to this one and is also of interest. On the strength of these patents, I'd argue that Frank Wood invented the stepper motor in 1912 (the filing date for the first patent)—but please do get in touch if you know differently.